The British and Americans had landed at Anzio on 22 January 1944, but strong German pressure had kept the Allied invasion force confined to the beachhead. 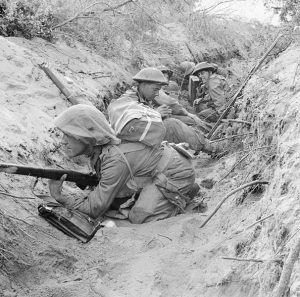 This week in the war, on 23 May 1944, the Allies mounted a general offensive in the Anzio area. The Germans held firm and Allied losses were high. However, by 25 May, the Americans had broken through the German forces encircling Anzio. US commander, General Mark Clark, ordered his troops to push on towards Rome. This entry was posted in World War II and tagged Anzio, Mark Clark. Bookmark the permalink.